Xiaomi has unveiled a smartphone with high-end features and a budget price, under a new brand. The Poco F1 features the latest Snapdragon chip, a larger-than-normal 4,000mAh battery and up to eight gigabytes of RAM - matching Samsung's Galaxy Note 9 in those specifications. But it will cost substantially less than flagship models from rival "affordable" brands when sold in India. One expert said the launch may force other firms to rethink their prices. "It's got the best Qualcomm processor you can get right now while in essence costing about half the price of some rivals," said Mike Lowe, reviews editor of the gadget site Pocket-lint, who has tested the device. "It's very powerful with a massive battery, and the consumers it is targeting are not going to worry too much about the fact it's a bit bulky. "This is Xiaomi trying to keep the dominance it has of the Indian market, and to appeal to other territories too." The basic model of the Poco F1 - which has 6GB of RAM and 64GB of internal storage - is 20,999 rupees ($300; £233). The top-end version, with a synthetic fibre back and more RAM and storage - is 29,999 rupees ($430; £332). Local press have identified its nearest competition as being the OnePlus 6 and the Asus ZenFone 5Z. Models of the former are priced between 34,999 and 43,999 rupees while those of the latter range from 29,999 to 36,999 rupees. Xiaomi's price advantage becomes even wider to members of HDFC bank, who receive a 1,000 rupee discount. Only Huawei's new Honor Play beats the Poco F1 on price - 19,999 to 23,999 rupees - but its specifications lag behind. The Poco F1 has only been confirmed for India at this point, where it will be released on 29 August. But its Chinese maker has said it plans to bring the handset to about 50 other countries. One expert said Europe could be included. "Xiaomi is now moving into markets it hadn't targeted and opening conversations with mobile operators," commented Ian Fogg, a mobile industry analyst at OpenSignal. "And they are now using Qualcomm chipsets, which operators are comfortable with and used to dealing with - making its products more attractive to them. "That's important, because unlike in South and South-East Asia, where a lot of handsets are sold directly to consumers, in Europe most phones are still sold via the operators." Xiaomi has managed to hit its price point by making design trade-offs. It uses a five-year-old version of Corning's Gorilla Glass for the display, which is three generations behind the latest release. Its cameras do not have optical image stabilisation. In addition, the Verge news site reports that the phone's body picks up grease easily and its audio quality is "tinny". But early reviews suggest it can handle processor-intensive Android games without signs of a struggle, and does not get hot in the hand thanks to liquid cooling. "The phone itself is superb, offering unmatched value for money in this category," said Android Central's review, although it added that it "doesn't look premium by any stretch of the imagination". The Poco F1's release comes at a time of resurgence for Xiaomi. After a slump in sales and falling behind several domestic competitors in 2016, it admitted it had "pushed ahead too fast". Since then, however, it has regained ground and is now the fourth best-selling handset maker in the world and the top vendor in India, according to IDC. The market research firm says Xiaomi's success is in part down to it increasing sales through physical stores while maintaining its "dominance in the online space". 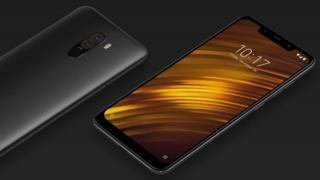 The Poco F1's launch coincides with Xiaomi's publication of its first set of financial results since floating its shares in Hong Kong in June. The numbers showed a net profit of 14.63bn yuan ($2.1bn; £1.7bn) compared to a net loss of 11.97bn yuan for the same period in 2017. In addition, it said that its sales were 68% up on the year, thanks in large part to the popularity of its smartphones.